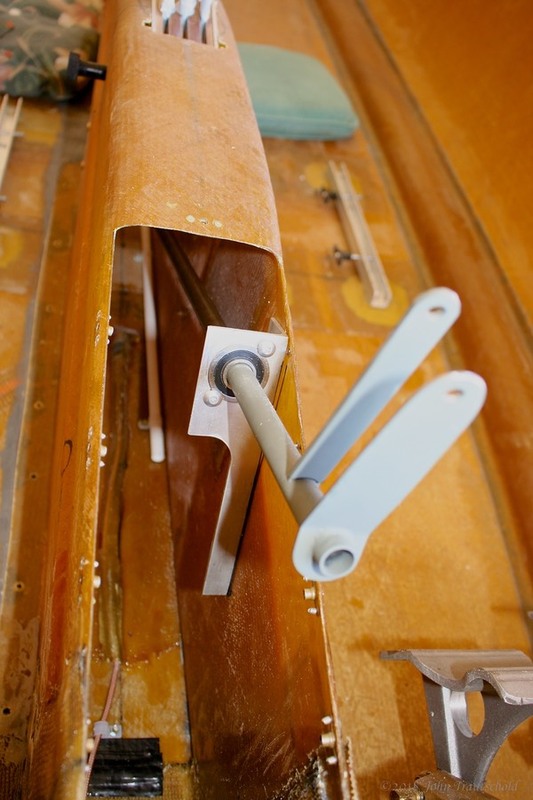 While installing the keel itself isn’t that difficult (other than making sure it’s perfectly centered) installing the aileron control mechanism is anything but easy. The difficulty comes in because I have a newer system that isn’t very well documented. I purchased the side stick control option which totally changes the way in which the aileron torque tubes are installed. Hopefully this page helps future builders with this process (once I figure it out, that is). It also turns out that I’m one of the first builders to build a 100% aileron torque tube system. The old systems were a hybrid between torque tubes and cables! Because I’m building a system with the side stick control option as well as the bench rear seat option (basically the XL-5 version) the keel construction instructions are spread amongst multiple manuals. Chapter 6’s instruction are for the standard center stick controller without the cutdown keel or the luxury keel overlay. The XL-5 version has a separate set of instructions for Chapter 6, called Chapter 6A. But even these instructions aren’t accurate for the side stick control option since they detail for the standard center stick. There is yet a third manual called the “Velocity Side Stick Control Installation Guide”, but this manual, I hate to say, is poorly written with little drawing details. 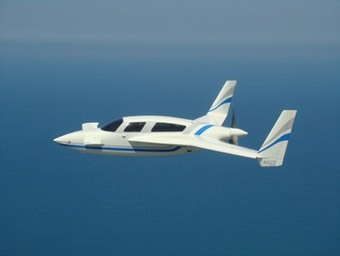 Plus, it’s written for the builder who is modifying their standard center stick aircraft! ARGH!!! Thank goodness “long distance” calls are now basically free since I’m spending a lot of time on the phone talking to the factory about this! Let’s start with something simple, like cutting down the rear portion of the keel (which I already did in Section 6.2.0) and installing the nut plates which eventually hold the new carbon fiber cover. The rear of the keel gets cut down to make room for the rear bench seat. Although it’s way to early to install this yet, here’s a photo showing the placement of the luxury keel option that comes as part of the side stick controller and XL-5 options. 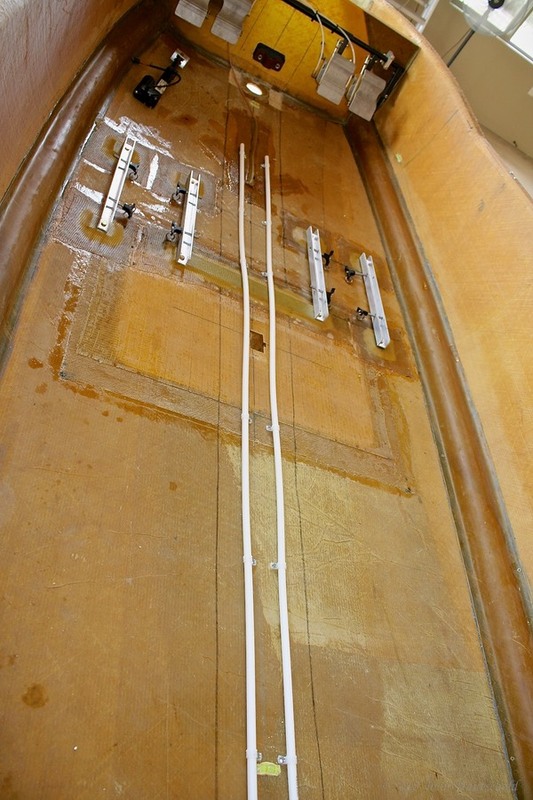 This photo just shows how the luxury keel is located over the top of the standard keel. In case you haven’t installed a nut plate (and you get to install a lot of those on this project), here are a few photos showing how I do it. It’s pretty simple actually. The first step it so locate the positions for all of the nut plates. 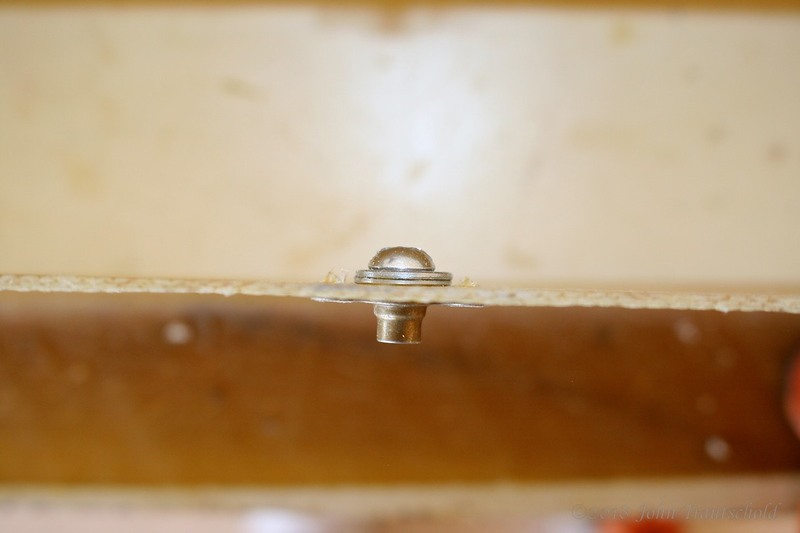 Once the main hole is drilled, I then use a screw with a couple of washers to hold the nut plate into position so that I can use it as a template for drilling the rivet holes. The rivets hold the nut plate into position. This is how I hold nut plates in place while drilling out the rivet holes. 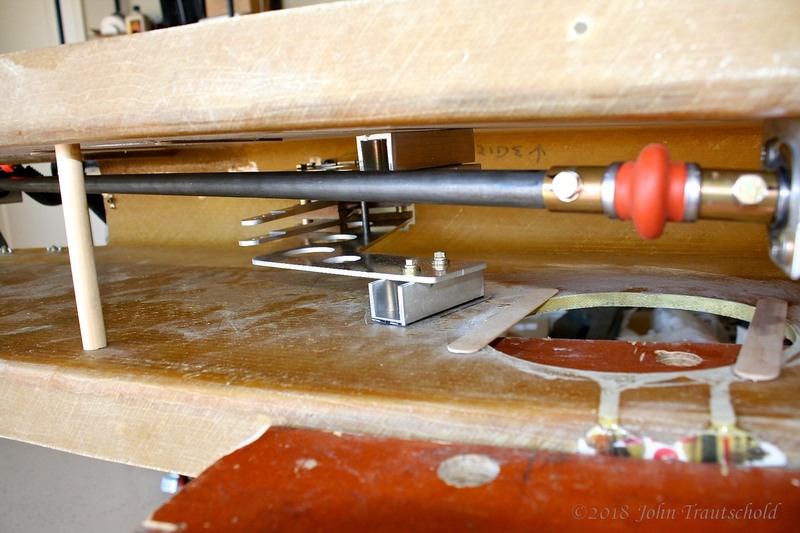 Another view showing how I hold the nut plate in place for drilling. Once the holes are drilled, I remove the temporary screw to release my nut plate template, countersink the entrance side of the rivet and, voilà, all done! 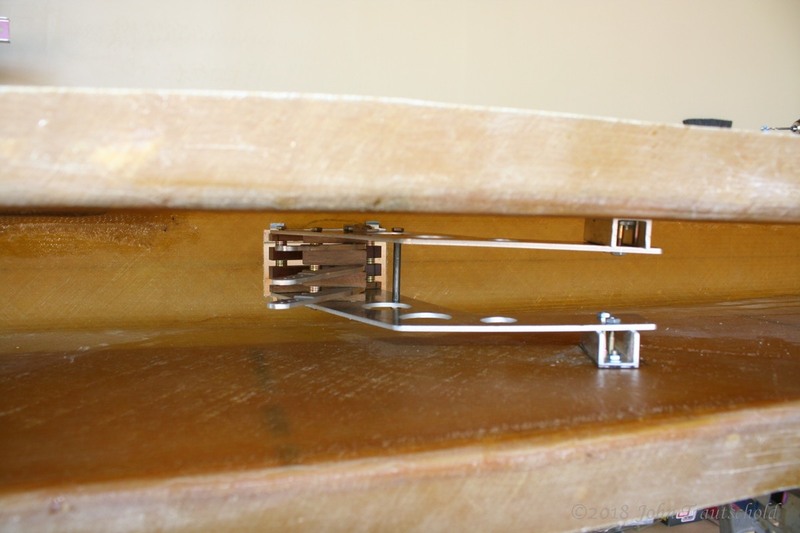 If you scroll back to the top of the page, you can see all of the nut plates installed along the edge of the keel opening. 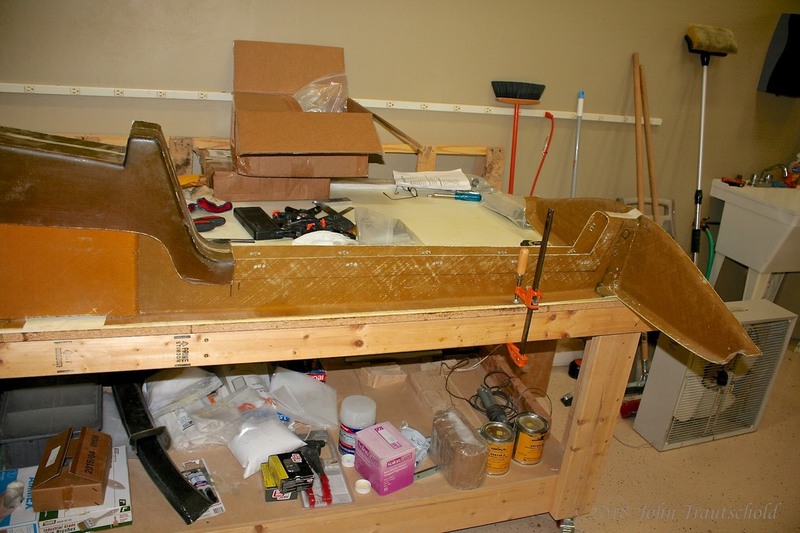 The next step is to begin the installation of the aileron control mechanism. This is what I discussed at the top of this page. There are a lot of parts with no clear instructions on how to install them. There certainly are bits and pieces scattered amongst the various “Chapter 6’s”, but trying to figure out how it all fits in my case is turning out to be a challenge! Before continuing with the aileron control mechanism, the factory suggested that I install the throttle quadrant first. That’s a great suggestion for a number of reasons, not the least of which is that it turns out to be much easier to install before the keel is permanently mounted in place. The first step is to locate the position of the throttle quadrant which is dependant on whether or not the luxury keel option gets installed. In my case it does. The location of the first hole in the keel itself is based on the location of the quadrant in the luxury keel. Here’s the keel hole itself - the next photo shows the hole cut into the luxury keel. Here's the first hole cut into the top of the keel to make room for the throttle quadrant. The luxury keel lays on top of the main keel so I had to cut a hole in that as well for the quadrant. Once the hole are created it’s time to test fit the quadrant. The width of the quadrant is much skinnier than the keel so I made some brackets out of u-channel to fill up the space and to create an easy way to solidly mount the assembly. The test fit of the quadrant looks good! Here's another view of the quadrant test fit. Even though the factory supplied the quadrant with the knobs attached, I decided to take the assembly apart, remove the knobs, sand down the aluminum and spray paint the handles a hammered gray. Again, it was much easier to do this now than after the keel gets installed. For now, I have those handles covered in plastic to protect the paint from scratches. 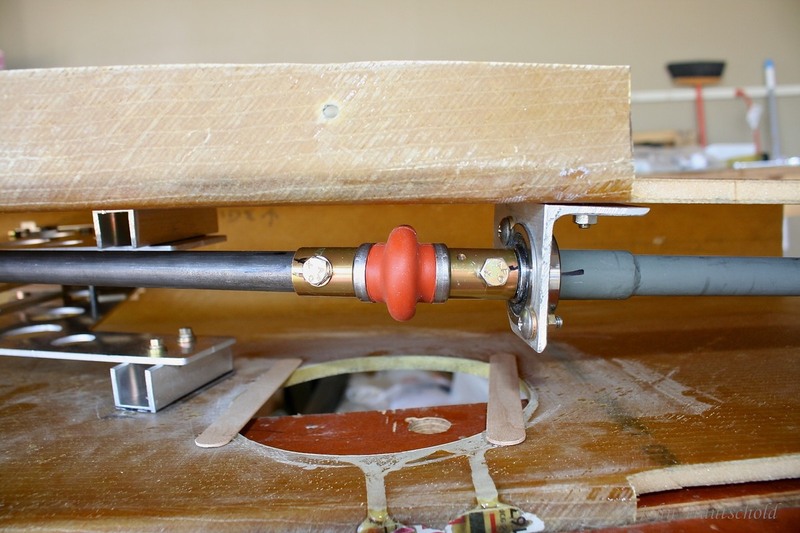 I also decided to run some PEX lines down the middle of the keel to support the brake lines. Some builders run the brake lines along the sides of the fuselage, but since I’m mounting the parking brake valve inside of the keel, I decided to run the brake lines there. The PEX tubing protects those brake lines and also makes it really easy to pull them out should they need to be replaced. I decided to install this PEX tubing for use as guides for the brake lines which get installed later in the process. Now that the prep work is finished, it’s back to installing aileron mechanicals inside of the keel. One of the other reasons for installing the throttle quadrant first is to make sure that the aileron torque tubes clear the throttle assembly. It’s a tight fit but in the end it all worked out perfectly. You can see in the photo below how close the second torque tube gets to the bottom of the throttle quadrant! Here's a view of the test fit for the torque tube to make sure it clears the throttle quadrant. 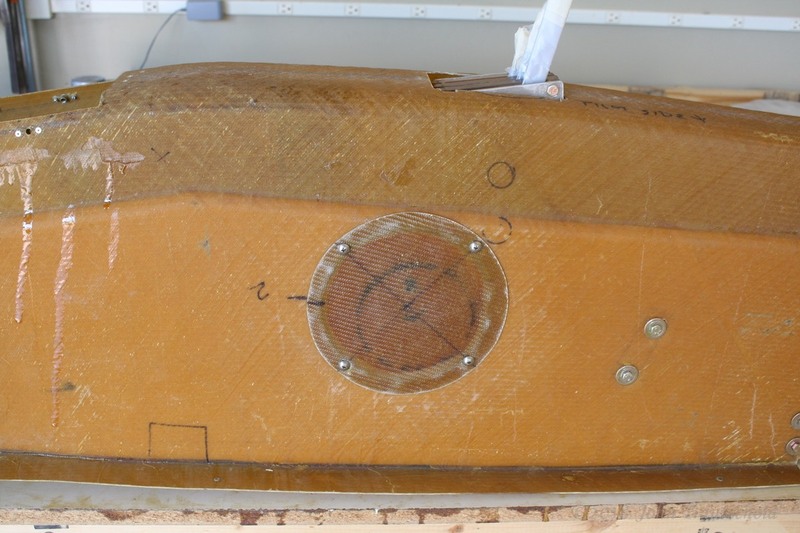 The next photo shows the torque tube that passes from the middle of the keel to the aft aileron control plate. Because the control system needs to “bend”, Velocity supplies a high-quality universal joint, seen below in the center of the photo. All of the torque tubes are supported by special brackets that hold ball bearings for smooth operation of the aileron controls. You can also see the beginnings of one of the maintenance access holes I drilled into the keel. The one shown here is specifically for accessing the universal joint should it ever need to be replaced, and also for inspection of the mechanics at this location. There’s a second access hole on the opposite side of the keel that provides access to the throttle quadrant. Here's the universal joint temporarily being held in place for a test fitting. Speaking of the access holes, here’s the process I used for making them. to begin with, I purchased a 6” diameter hole saw. Using that created a perfectly round hole and provided a way to save the cutout piece which becomes the access hole cover. 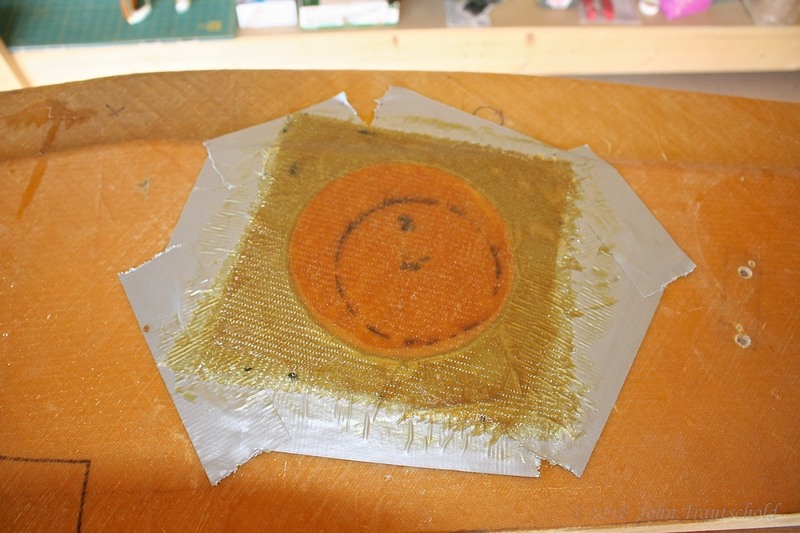 Once the hole is cut and cleaned up, I used duct tape as a release agent and popsicle sticks temporarily glued underneath to provide support to the disk while the fiberglass layups cured. 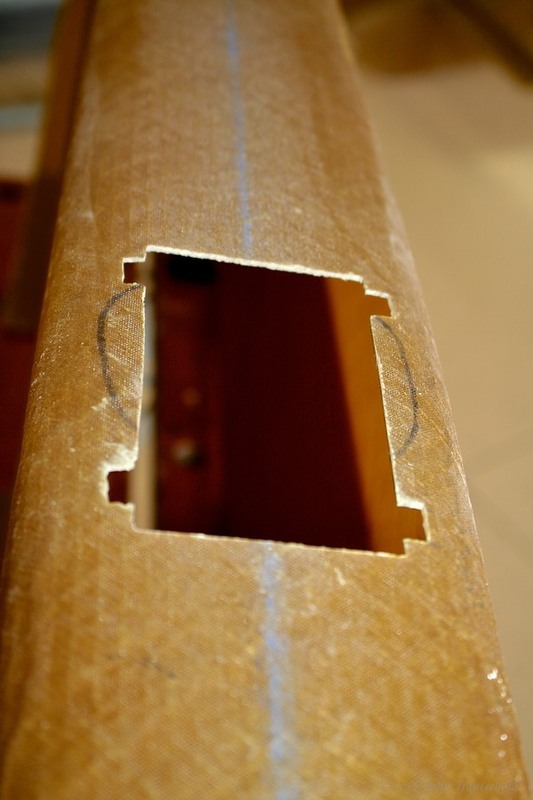 The access holes are six inches in diameter and the part that gets cut out becomes the cover for the hole! 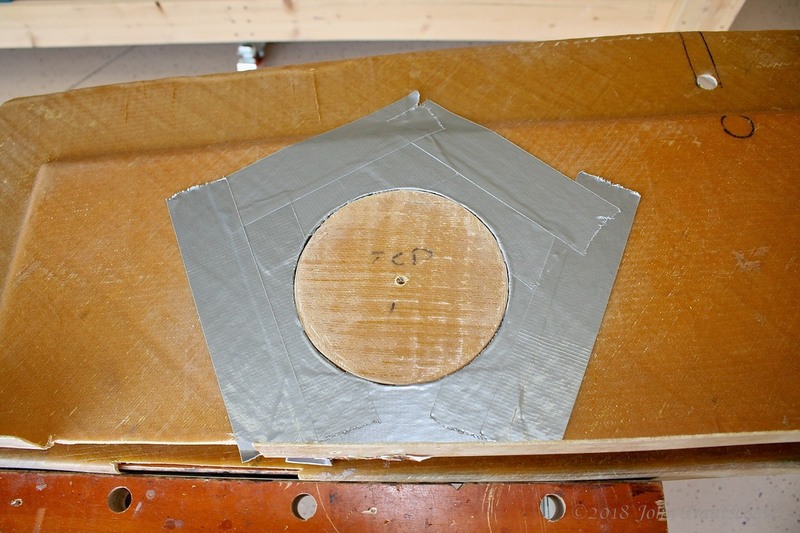 The next photo shows the layup over the disk which, after being trimmed, becomes a cover for the hole. These six inch access holes will later be used for inspection and maintenance. And here’s the finished product after being trimmed. I installed some nut plates in the keel so that I can easily remove the cover. Here's the finished cover. Eventually all of this gets covered with upholstery to make it look nice! 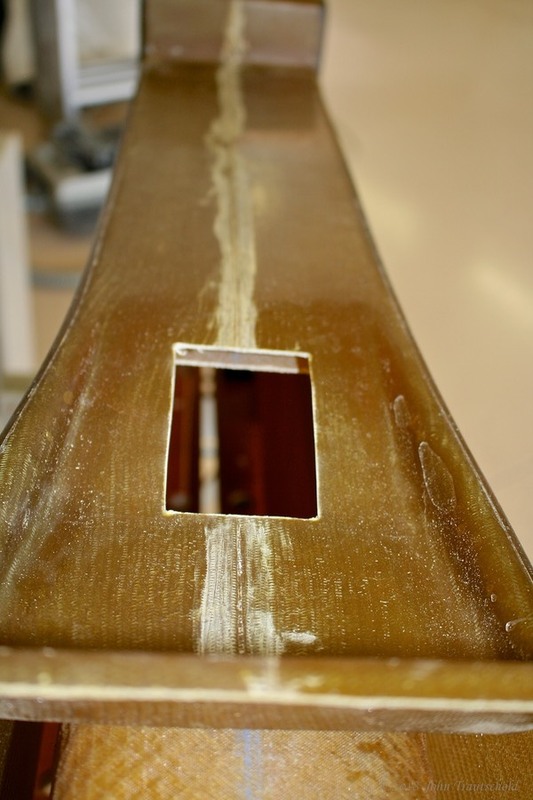 One interesting little problem I ran into is the thickness of the keel at the access hole locations. 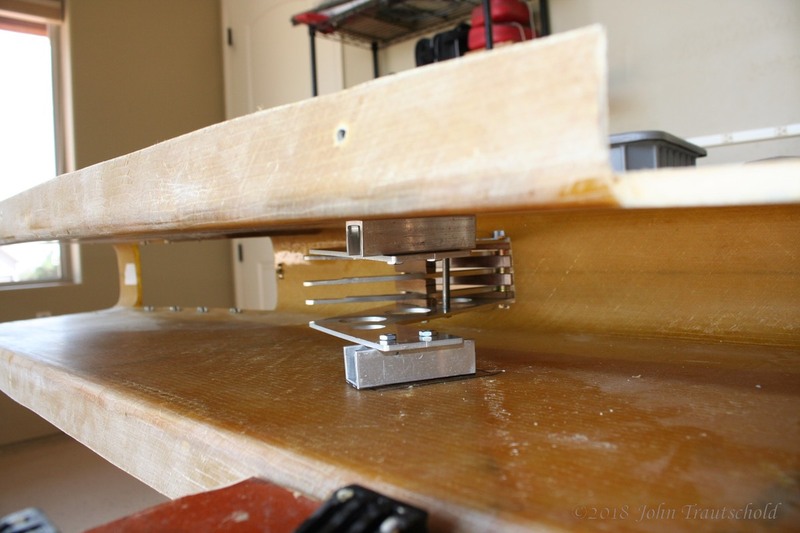 Normally the nut plates get riveted to the fiberglass but there are no rivets long enough, so I decided to tap the nut plate mounting holes for 4-40 flat-head screws. The screws perfectly hold the nut plates in place! 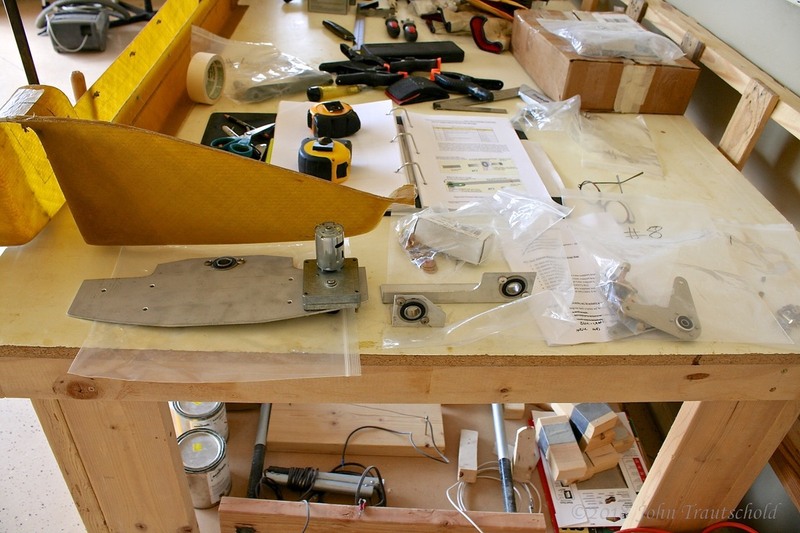 Finally, it’s time to install the aft aileron support plate and bell crank assembly. This assembly includes an aileron trim motor (seen on the right side of the whale tail) and tensioning rope and springs. The rod ends are installed and for now just dangling in place. Eventually they get attached to push rods that will control the ailerons. You can also see the PEX tubing, used to protect and support the brake lines, exit the keel here at the bottom. This whole aileron control system process included a lot of phone calls to the factory. It turns out that I’m one of the first builders using a 100% pushrod system for aileron control. The instructions shows the rod ends connecting to cables which pass through the firewall which then attach to the ailerons in the wings. The factory redesigned this system for the V-Twin and they liked it so much they decided to use for all new kits. However, that means there are no instructions. Thanks to Scott Swing, I think we’ve got it all figured out! This is the aileron bell crank assembly at the aft end of the keel. 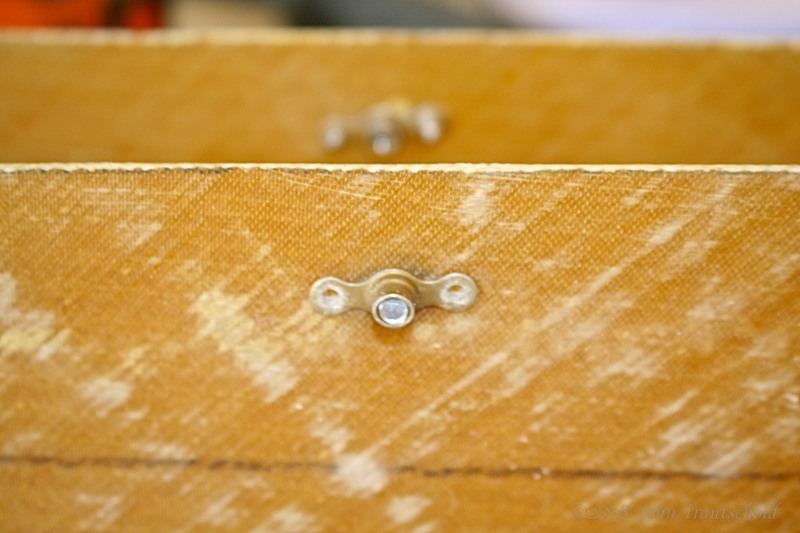 The rope end knots eventually get glued tight once final tension adjustments are completed. 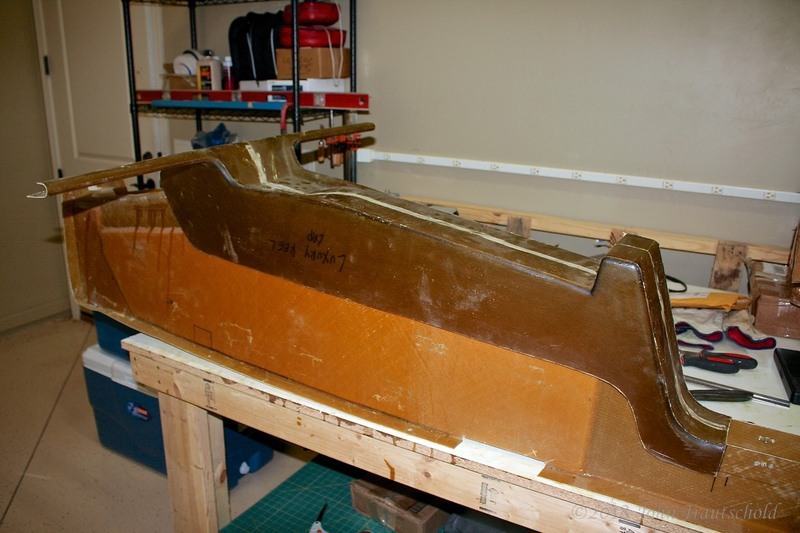 And finally, here’s the keel after it’s been installed in the lower fuselage. It’s epoxied in tight - no getting it out now! The keel is epoxied in place. You can also see the throttle quadrant installed and the speed brake actuator in place. 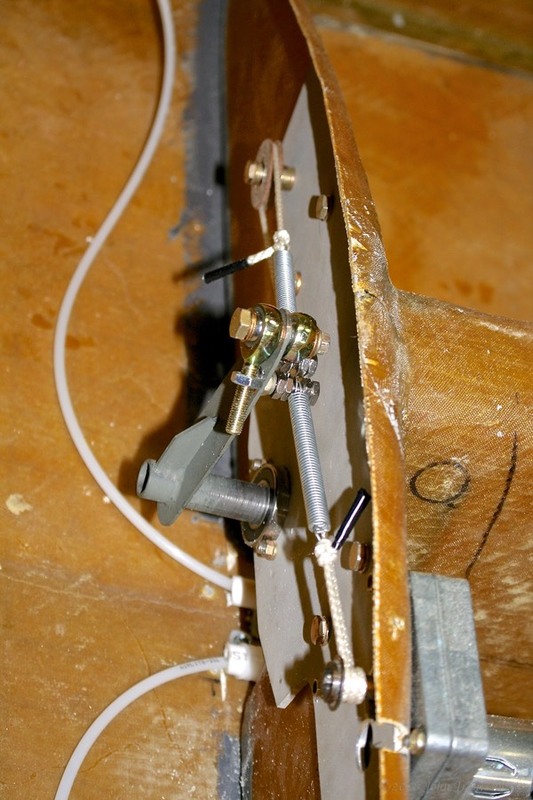 Note that the rudder pedal and brake assembly is not properly attached to the canard firewall in the photo above. I needed to loosen it up in preparation for installing the nose gear assembly which comes up later. Finally, I installed the forward aileron bell crank torque tube. An assembly of rod ends and control tubes gets installed between the two tabs that are welded to the torque tube. These eventually get attached to the pilot and co-pilot control sticks. This bell crank is forward of the instrument panel and eventually gets hooked up to the two side stick controllers. 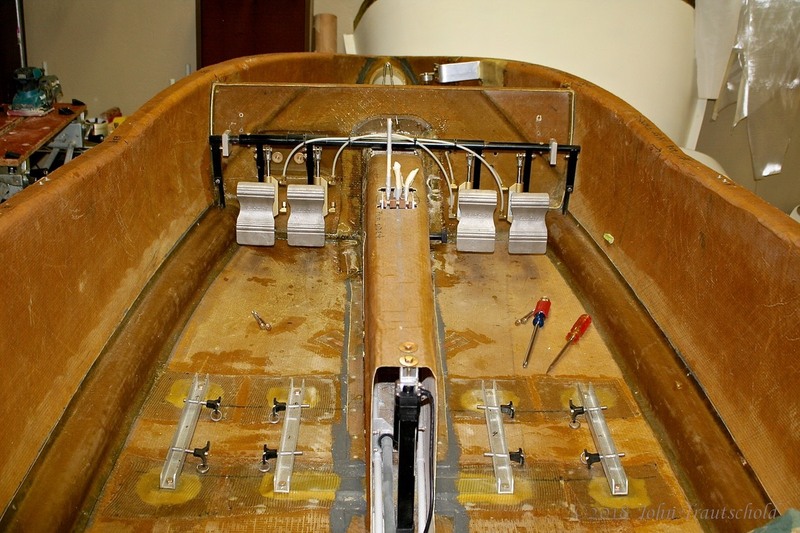 Now that the keel is in place for good, it’s time to finish up the installation of the speed brake and its actuator. The speed brake itself was prepared back in Section 6.1.0, but on the next page, Section 6.5.0, the actuator is installed and tested for proper operation.